Construction on the The Cambridge Savings Bank building at the former Mobil gas station site is due to start once the weather warms up. The Bank will feature a dual lane drive-thru. While the Bank is fronting Great Road, cars will need to turn on to Weber to enter the Bank parking lot. Artists rendition of the new Cambridge Savings Bank. Click on the picture for a larger image. The Dunkin' Donuts inside the Bedford Stop & Shop has closed. 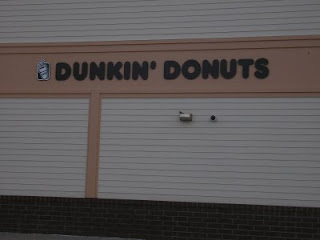 According to Bedford employees, the Dunkin' Donuts closed on January 7th. 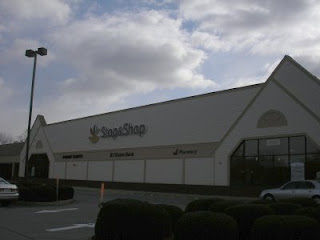 The reason it closed, is that Stop & Shop decided not to renew it's master agreement with Dunkin' Donuts. In 2006, Stop & Shop announced an agreement with Starbucks and begun replacing the Dunkin' Donuts with Starbucks. This agreement has been cancelled and while any existing Starbucks will remain, no new ones will be built inside Stop & Shop. As far as the Bedford Store, the Dunkin' Donuts is being replaced by a Stop & Shop branded coffee store featuring Green Mountain Coffee. While the Stop & Shop Dunkin' Donuts has closed, the sign still remains up. I suspect this will come down soon. While the Dunkin' Donuts at the Stop & Shop has closed, a new Dunkin' Donuts store opened in December at the new Northside Convenience and Gas at 44 North Road.